On 5 August 1914 Digby Denham, the Premier of Queensland, received a telegram from Joseph Cook, Prime Minister of Australia advising that official information had been received that war has broken out with Germany. 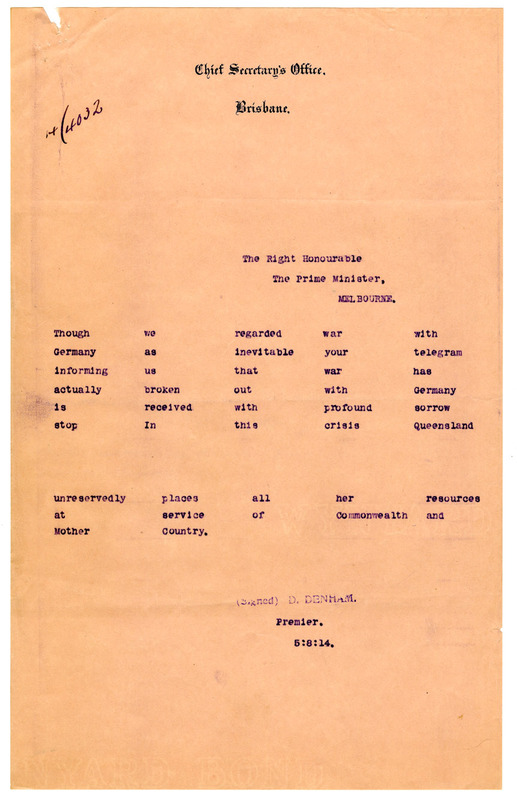 Telegram to the Premier of Queensland from Joseph Cook, Prime Minister of Australia advising that official information had been received that war has broken out with Germany. Mr Denham promptly responded to this news saying: Though we regarded war with Germany as inevitable your telegram informing us the war has actually broken out with German is received with profound sorrow. In this crisis Queensland unreservedly places all her resources at service of Commonwealth and Mother Country. This is probably one of the most significant documents of this time period in the Queensland State Archives collection as it is with this communication that the Premier commits Queensland to not only sending service men and support personnel overseas, but also to all the subsequent events and hardships that Queenslanders witnessed on the homefront during the next couple of years. As indicated by his words in the telegram, Denham acknowledges his regret on having to make this announcement. Who knows what he was feeling at this time? 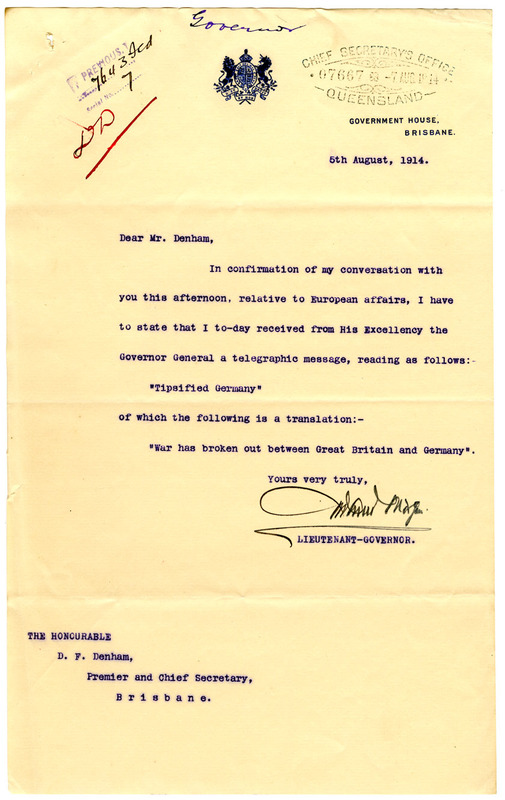 Letter to Mr D. Denham, Premier of Queensland from Lieutenant-Governor of Queensland, Arthur Morgan relaying the telegraphic message from the Governor General of Australia about war breaking out between Great Britain and Germany. 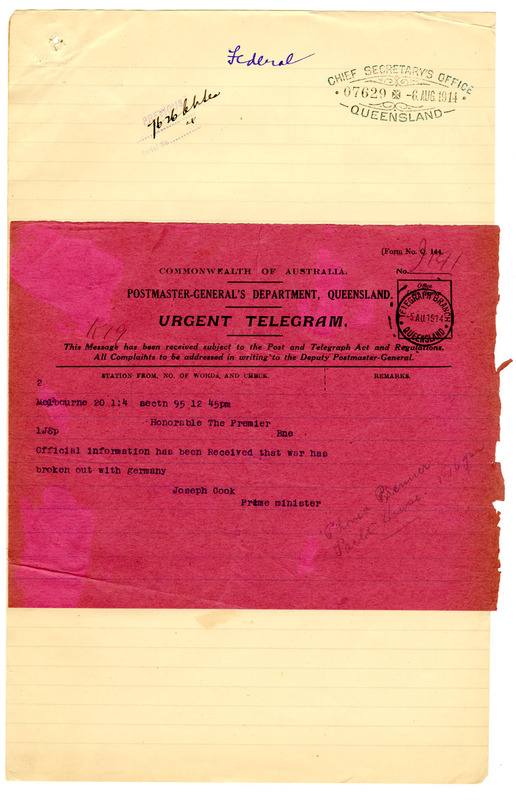 These telegrams and letters are the first official records which reflect the events at the outbreak of the First World War and, along with subsequent communications, are held at the Queensland State Archives.